From the authors of Jackson Pollock: An American Saga comes an exquisitely detailed, compelling, and ultimately heartbreaking portrait of creative genius Vincent van Gogh. Steven Naifeh and Gregory White Smith galvanized readers with their astonishing Jackson Pollock: An American Saga, winner of the Pulitzer Prize for biography, a book acclaimed for its miraculous research and overwhelming narrative power. Now Naifeh and Smith have written another tour de force—an exquisitely detailed, compelling, and ultimately heartbreaking portrait of creative genius Vincent van Gogh. Working with the full cooperation of the Van Gogh Museum in Amsterdam, Naifeh and Smith have accessed a wealth of previously untapped materials. While drawing liberally from the artist's famously eloquent letters, they have also delved into hundreds of unpublished family correspondences, illuminating with poignancy the wanderings of Van Gogh's troubled, restless soul. Naifeh and Smith bring a crucial understanding to the larger-than-life mythology of this great artist—his early struggles to find his place in the world; his intense relationship with his brother Theo; his impetus for turning to brush and canvas; and his move to Provence, where in a brief burst of incandescent productivity he painted some of the best-loved works in Western art. The authors also shed new light on many unexplored aspects of Van Gogh's inner world: his deep immersion in literature and art; his erratic and tumultuous romantic life; and his bouts of depression and mental illness. 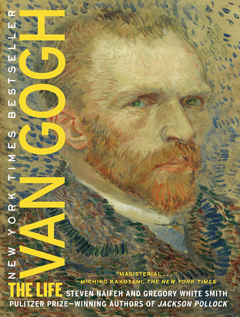 Though countless books have been written about Van Gogh, and though the broad outlines of his tragedy have long inhabited popular culture, no serious, ambitious examination of his life has been attempted in more than seventy years. Naifeh and Smith have re-created Van Gogh's life with an astounding vividness and psychological acuity that bring a completely new and sympathetic understanding to this unique artistic genius whose signature images of sunflowers and starry nights have won a permanent place in the human imagination.